bbq pork | Happiness is a warm oven. Posted on January 2, 2011 by Jenn C.
I spent the entire afternoon preparing for my classes this week–still in my pajamas, hair in a bun, materials sprawled out all over the living room floor. I’m mostly prepared–I could do more, but I want to salvage the last remaining hours of my vacation. It’s freezing here today–neither my husband nor I want to get dressed to purchase groceries to cook with–nor do we want to walk or drive to pick up take out. Delivery? Sounds perfect, doesn’t it? A lazy and indulgent treat (which I indulge in too often to make it an indulgence) for the last evening of our holiday vacation. We ordered Shrimp Foo Young, BBQ Pork, and Ma Po Bean Curd from the nearest Chinese restaurant. 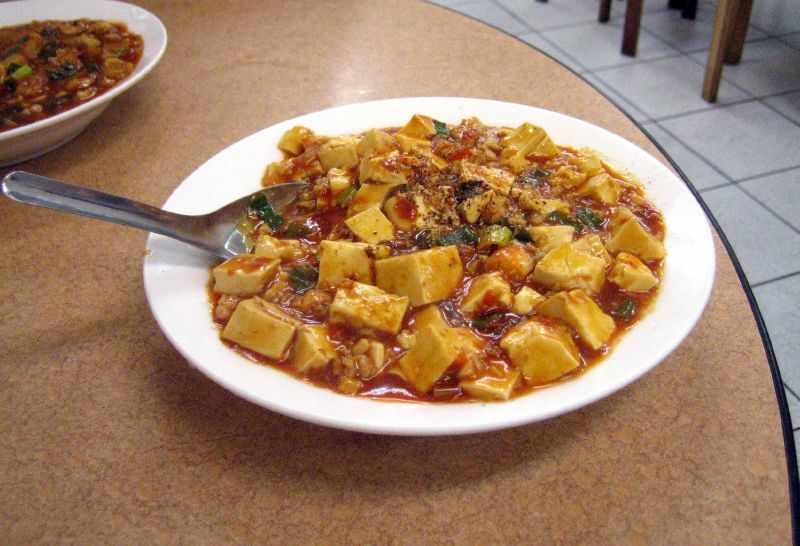 My friend made Ma Po Tofu this weekend (here’s a recipe. Not authentic, though, as it omits the Sichuan peppercorns. ), which is supposed to be tofu in a meat sauce. This “Ma Po Bean Curd” is vegetarian with “Green peas, shredded black mushrooms and bean curd sauteed in spicy sauce.” Traditionally, the dish is made with ground beef or pork, so we’ll see how this vegetarian rendition tastes. It might be Ma Po in name only and have nothing to do with the original dish. Contrary to popular belief, Sichuan peppercorns are not spicy–although many Sichuan dishes are spicy. They aren’t even related to peppercorns. The Sichuan peppercorns are supposed to have a numbing affect, actually, to counter-balance the spiciness in the dish. Here’s a Ma Po Tofu recipe with the authentic Sichuan peppercorns. Random information: According to Wikipedia, “Ma Po” means old lady with a pock-marked face.